Practical solution or more flogging of an already dead horse? Buffalo Technologies has today announced a new double/triple format optical disc drive that can read and write Blu-ray and standard DVD and also read the now defunct HD DVD format. 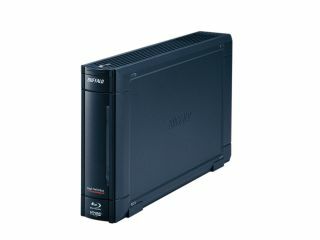 The BRHC-6316U2 Combo Drive, which has been available in Japan since last year, boasts single and double layer Blu-ray read/write speeds of up to 6x, along with HD DVD read speeds of up to 3x; and DVD read/write speeds of up to 16x. Using the drive dual-layer Blu-ray discs can be used to store up to 50GB of data. The combo drive can be hooked up to any PC via a simple Plug&Play connection via USB. The drive also uses Buffalo’s patented TurboUSB technology to further boost transfer speeds. Could be a neat little solution for anyone who built themselves up a sizeable collection of HD DVD titles they don’t really want to sell at a loss and then replace at a premium. Buffalo’s new Combo Drive will be available in the UK from late April at an approximate cost of £284.